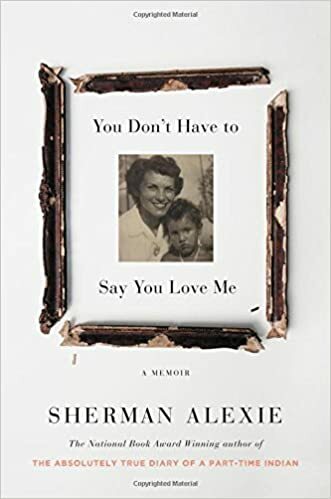 A few days ago I finished Sherman Alexie’s memoir, You Don’t Have to Say You Love Me. It is an amazing and powerful book, mostly about his memories and experience of his mother, a member of the Spokane Tribe. She was a maker of quilts, and the book itself is a quilt of story, grief, and anger in sections of narration and poetry. Alexie, as he does in all his writings, draws us into the difficult and painful complexities of the history and present of our indigenous sisters and brothers and our relationship to all of that, and helps us laugh with him and at ourselves along the way. His own story of moving away from the “rez” is a strong one, but I came away wanting the “rez” life to be equally as strong and feeling his deep sorrow that it is not. He is a wonderful writer, so all the poems and narration are clear and beautiful even when the truth of the story is hard to absorb. And there are many parts that are emotionally hard to read in this book. There are multiple ways in which we white people of privilege can find some pathway into our racism, and this book is one small way to think seriously about all of that. But Alexie’s book tells of the powerful force of racism in every culture, even Indian to Indian and Indian to white folk. Dealing with racism is a common topic in our culture right now, from many perspectives, and it should be. But this memoir, at least for me, has helped think about that for myself in new and profound ways. I am grateful to Alexie for allowing us this look into his life that helps us look well into our own. Often memoirs ask for the reader’s applause. This one asks for our participation, as we are invited into Alexie’s life and grief and journey.